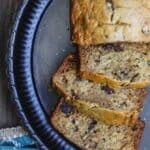 Easy olive oil banana walnut bread! You get to skip butter and sugar for this reduced guilt, still indulgent banana bread. So moist and every bit as flavor-packed. See video tutorial just above. Now add the bananas yogurt, milk, baking soda, vanilla extract, cardamom, cinnamon, and nutmeg. Whisk again. Using a spatula, stir in the flour; then add the dates and walnuts and stir the batter again until everything is well combined. Lightly oil a non-stick a 5 3/4 x 3 loaf pan like this one. Pour the batter into the loaf pan and shake very gently so it evens out. Bake in the 325 degrees F heated-oven for 55 minutes. Test by inserting a tooth pick into the middle of the banana walnut bread, it should come out clean. Remove from the oven and let the bread cool for 10 minutes, then transfer to cool on a wire rack for another 20 minutes or so. Slice and enjoy! Pro Tip: use the best extra virgin olive oil you can or you may risk a rancid-tasting loaf. I used our Private Reserve Greek extra virgin olive oil here; it adds great depth and keeps the loaf tasty and moist. Recommended for this recipe: organic ground cardamom and nutmeg. SAVE! Try our Ultimate Mediterranean Spice Bundle. Or create your own 6-pack or 3-pack from our all-natural or organic spice selections. Have you checked out our Greek olive oil bundle? !